Dutch filmmaker Paul Verhoeven has argued that the black comedy he'd purposely worked into the original RoboCop's intentionally “over-the-top” violence became less comical and more disturbing every time he had to tweak the edits to ensure an “R” rating after the MPAA deservedly saddled his work with an “X” eleven times in a row. Unfortunately, I have no way of verifying his claim or agreeing with his approach since the original cut of the work – once showcased unedited in two separate Criterion Collection format releases – has been “out of print” for quite some time and I'm unsure whether or not this “unrated” MGM disc provides us with Verhoeven's definitive first version. Yet, regardless of the fact RoboCop is seriously dated for a futuristic '80s dystopian film, watching it today for the first time, I found myself consistently at a loss in wondering how very much of it could have ever been alleged as funny... even on a cerebral “a ha” level rather than a laugh-out-loud one. Obviously, I appreciate the political implications and satirical jabs at the media as well as consumerism as we find ourselves watching the world as we know it crumbling all around us. But instead of inviting us to make subtextual leaps with our brains during intercut commercials and newscasts that offer a distinct allegorical fascist warning vibe, Verhoeven forces us to remain numb by the overwhelm of gore. In film's setting where the United States resembles a Middle Eastern war zone, city governments are left with no choice but to enter into questionable contracts with corporations. With this in mind, the work centers on the controversial new direction that technological corporation Omni Consumer Products takes in order to retain law and order for the police force of Detroit wherein, as the film begins, we're informed that recently more than thirty cops have been slaughtered in the line of duty. To avoid sending a man into do a Special Forces soldier’s job, Omni decides to build unstoppable robotic heroes instead as an ultimate hybrid of strength and bravery, without – they hope – the mess of emotion. And after our likable yet barely developed hero Officer Alex Murphy (Peter Weller) is brutally murdered by a group of carnage crazed criminals during his first day working for a new department, Omni decides to put their ideas into action, building Alex into the eponymous ultimate crime fighter. Although groundbreaking for its time, the struggles faced by the special effects department are magnified in this Blu-ray collection, particularly in a once dazzling but now unintentionally giggle inducing stop-motion sequence that occurs late into the movie. Overall, it’s an uneven presentation of a darker brand of superhero picture we’d find a few years later with Tim Burton’s masterful Batman along with the astute political ideas which had been infused into screenplays during the dystopian ‘80s trend of science fiction cinema evidenced in Blade Runner , Escape from New York , The Terminator and Verhoeven’s own Total Recall . And while I admire the attempt of RoboCop, ultimately, it’s a franchise better left in the past, which becomes painfully clear in the nihilistic, downright distasteful follow-up from director Irvin Kershner. On the surface it appears to rehash the same basic storyline and archetypes utilized in the first movie along with teasing viewers that it will look further into the ethical dilemma faced by Murphy/RoboCop as an outsider who’s neither 100% human nor robotic. Yet, quickly into the sequel, it abandons all hope of new terrain by instead soaking up as much slime and decay as possible in its morally reprehensible plot that involves not just the most addictive drug ever created but also decides to make a preteen boy into the embodiment of soulless, murdering evil. While obviously it’d be naïve to pretend that there aren’t children the character’s age that partake in criminal activity both as members of gangs and also while just trying to survive, in the case of RoboCop 2, the young boy is used purely for the sake of exploitation. A misguided follow-up that makes the original film look like a masterpiece by comparison, RoboCop 2 proved to be just as unappealing for members of the original cast including series stars Peter Weller and Nancy Allen who disliked the direction Kershner’s work had taken. 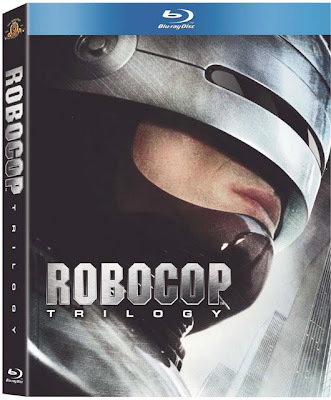 Nonetheless, while the second sordid film isn’t the least bit improved in high definition, the one silver lining that MGM’s new RoboCop Trilogy release offers is in unveiling the little-seen third installment from Fred Dekker. 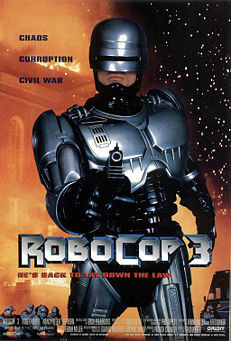 While it’s still a far cry from the inventive if flawed original, the ultra-violence is now toned down and RoboCop 3 leads the crime-fighting officer (now played by Robert John Buke) into PG-13 superhero movie territory that’s more befitting of the transition from individual provocative popcorn picture into franchise fodder. Although the sudden change in tone makes some of the action silly as RoboCop becomes a champion of the people after Detroit begins kicking out residents under the guise of “progress” and an underground group of rebels including a whip-smart, adorably spunky young girl programs Murphy to join their side, it’s at least far more watchable than the second picture. In this sense, it’s reminiscent of the way that Back to the Future had wandered too far into the apocalypse with its grim second helping before returning with a crowd pleasing, Hollywood (and fan) friendly trilogy bookend. Of course, Back to the Future is the series that rightfully continues to live on as RoboCop’s crime-fighting foray in the time-traveling genre seems both dated and terribly inconsistent in comparison with its multiple-personality style three wild interpretations and emphasis on the unrelenting dark side of humanity. 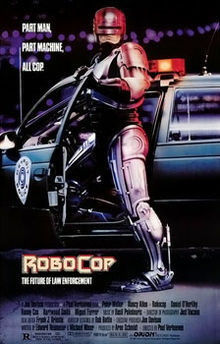 Essentially Robo was unable to fully crossover like The Terminator or garner the pseudo-superhero following for which it longed from the start as the movie failed to live up to anyone’s expectations (or first impressions) with Verhoeven’s button-pushing style and singular vision that made it harder to relate to our hero or take in the bigger picture. 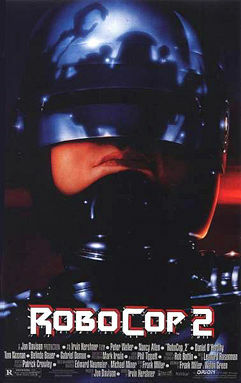 And while this unwillingness to compromise his desire for satire, black comedy, political allegory and ultra-violence by spending more time on character building helped make the first RoboCop so unique, at the same time, it also ensured that the sequels would never be compatible with the original operating system, which becomes painfully evident in this Blu-ray collection.